Copenhagenize.com - Bicycle Urbanism by Design: Mobility Week in Paris: "Bike to Work"
Mobility Week in Paris: "Bike to Work"
The European Mobility Week is coming soon! 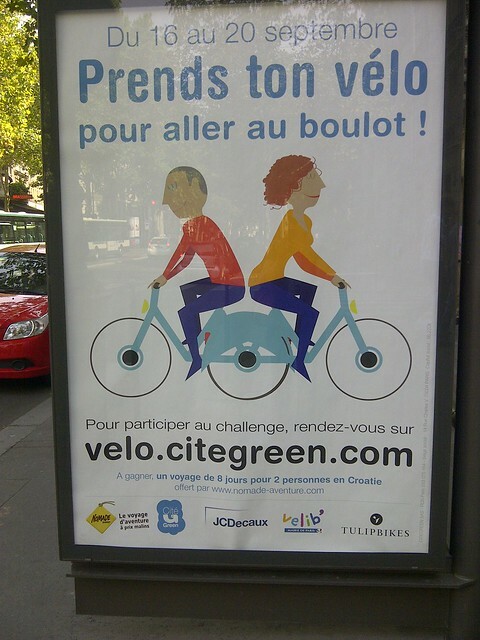 Here's a good initiative in Paris: the city encourages the inhabitants to use their bike to go to work. You can sign up on the website: velo.citegreen.com and track how many kilometers you ride the whole week. You can win a week's holiday in Croatia. Strange way to reward the cyclists. Is it so tiring to ride a bike for one week? You can also take a picture and win a glow-in-the-dark water bottle. I've lived for years in Paris and I can tell you there are no water bottles on bicycles ridden by Citizen Cyclists. Parisians: dress up and ride your bike! Look how chic Copenhageners are when we are heading for the office. Clotilde Imbert is a French urban planner working with Copenhagenize Design Co. here in Copenhagen.